Honestly, I debated whether or not I should share this giveaway for fear that I'm welcoming more competition for myself... cuz I want this baby! But, since she's been such an amazing bloggy friend and teaching resource for me, I figured I can't be that selfish. Erin from I'm Lovin' Lit is hosting an amazing giveaway for her new Interactive Writing Notebook, and it's not even available in her TPT store yet! 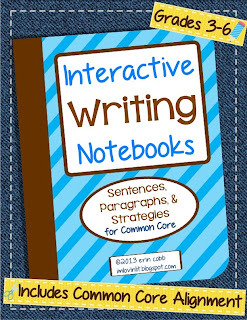 If you've used either of her Interactive Reading Notebooks, as I have, you know they are an invaluable resource. Seriously, Erin is the teacher I want to be when I grow up! If you haven't already, run over to her store RIGHT NOW to get yourself entered for her giveaway. There's not much time left!